...not making a tessellated pavement. I meant to go home. I was going to go home. But I got stuck at the office. I help my mother-in-law run her business, and I was putting in my hours on Thursday, same as always. But when my husband came to pick me up after having the oil changed in the car and having the tire patched and replaced, our afternoon was shot to pieces by the fact that the mechanic had not put the wheel on right. My husband and his father spent upwards of an hour on the thing while I kicked about looking to entertain myself. On this particular occasion, I had neglected to bring Veiled Rose with me, thinking I wouldn't have time to read it between having lunch with my mother- and sister-in-law and the little ones, and having to work. Gee, was I wrong. Thankfully I had brought along an armload of books for my homeschooling sister-in-law to look at for my niece, and I had Everyday Life in Roman and Anglo-Saxon Times on hand. I wanted to read it, and a dead afternoon seemed like as good a time as any. La dee da, introduction, Rome has had a great impact on Western Civilization, Britain was nothing before Rome came, the whole shebang I've heard it before, and then...Chapter Two. Chapter Two: Calleva Atrebatum. (Oh, and other towns.) But Calleva! You may know it as Silchester. I know it as Calleva, seat of the Atrebates, a fluidly Romano-British town, and the home of some of my very best friends. I was perched in a nice folding chair, very Roman itself, in a patch of sun, staring in a kind of paralyzed delight at the aerial view of the town. She was laid out on a grid pattern, but somehow comfortably haphazard for all that. I said, "Hello, old friend," to myself, so that no one else would hear, and for a while I kept reading. But by the time I was led around to the West Gate and shown up by the authors to the entrance, I had to get up. There was an ink illustration of the gate with its timber bridge over the ditch under the shadow of the looming stonework wall, and in the text were all the dimensions. I'm bad with numbers, they simply don't speak to me, but when I was given the dimensions of the ditch I found something I could work with. I jumped up and ran for the garage where I was hoping my father-in-law kept a spare measuring tape. I found one. It was for twenty-five feet. With a little disapproving grunt that would have sounded better coming out of Eikin's nose and not mine, I shuffled around the gravel driveway for rocks. I could do this. It would be primitive, but primitive was my style. Doing some exceedingly awkward math in my head, I chose out four of the larger rocks and trekked with no explanation to anyone up to the road. I stood at the head of the drive and set down a stone, and stared down the length of the street. I began marching, doling out tape as I went. It was a ticklish business, rattling out the steel measurements on the asphalt, catching the steel tongue of the tape on the littler rocks, trying always to keep the darn thing straight. I measured out twenty-five feet, dug a rock out of my pocket, and put it down at the twenty-five feet marker. Then I began again, careful not to dislodge my marking rock from its place as I went. Cars drove by, keeping warily to the far side of the road. "Hello!" I muttered. "Don't mind me. I'm a writer." Twenty-five feet, fifty feet, a third stone gave me seventy-five feet and I had a little length of five feet to go. With a gesture of triumph I dropped the fourth stone in place and yanked up the tape, and turned to gaze at my marked-off length of eighty feet. The ditch around Calleva bloomed before my eyes. Eighty feet across, and there I stood on the brink of it, the asphalt and white marker-rocks shifting dream-like in and out with the image of the timber bridge and the stone- and earth-work walls of the town. I'm afraid my first thought was, How many bodies would it take to fill that ditch? I stepped on the end of the tape and ran it up as high as I could. Another two cars drove by, and this time I was feeling more than a little foolish waving ten feet of measuring tape in the air, but I didn't want to let on about it. Unfortunately, my just-barely-five-foot frame can't maintain a measuring tape at ten and a half feet, let alone the height of twelve feet that was the depth of the ditch. I let the tape fall over on my head, content with the general idea that the ditch was rather deep. Trotting back across the yard to deposit the measuring tape in its accustomed living space, I wondered if you could take the average volume of a human body and the whole length of the ditch to figure out how many bodies it would take to fill it. I don't think the grimed and oily men working on the three-legged car appreciated my proposal. I decided that was math for another day. What do you do for research? Uncle Aquila lived on the extreme edge of Calleva. 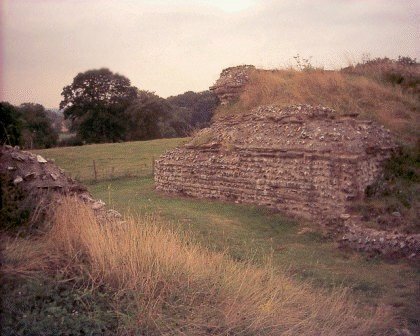 One reached his house down a narrow side-street that turned off not far from the East Gate, leaving behind the forum and the temples, and coming down a quiet angle of the old British earthworks - for Calleva had been a British dun before it was a Roman city - where hawthorn and hazel still grew and the shyer woodland birds sometimes came. How cool that you got to visualize ancient Calleva and have it come to life in your imagination! For me, "research" usually entails sitting in the corner of a Starbucks, pretending to write, but actually just people-watching. Thanks for the entertaining (and enlightening) post! This. Is. Awesome!!!!!! That's all I can say. It's always more cool when you can find a tangible, touchable, seeable way to make history come alive so you can visulize it. First, the dimensions of our charnel blocks. I believe anthropologists tell us that average height has been increasing over the years as nutrition improves, but even so let's assume that the average soldier, more hale and hearty than most, stood at an even six feet. That'll make the math easier, at any rate. By similar reasoning, let's assume that, taking into account their armor, they would be about two feet wide and one foot thick. Give or take. Now, how to array them. Obviously, it's a little callous to tell your soon-to-be bridge stones to try to die in an orderly fashion. But, we can assume that they'll be facing toward the castle walls when the arrows/stones/boiling oil do their work, and that they'll fall more or less forward, perpendicular to the length of the ditch. So we'll go with that. Next, the final dimension: the width of the bridge. Let's say six feet, to accommodate either three soldiers abreast, or a battering ram. The foundation of the bridge will have to be somewhere on the order of eight feet, to account for the inevitable shifting of the morbid mortar, and will taper up, so let's call the average seven feet. Right, then. 80 feet across, divided by six feet of dead guy is 13.3 repeating. Round up to 14 to account for the ones that manage to curl into the fetal position before expiring. Seven feet across, divided by two is 3.5, round up to four. And of course, 12 feet deep at one foot thick apiece is 12 corpses. The rest is easy: fourteen by twelve by four adds up to 672 writhing, moaning human stepping stones. We engineers usually include a "safety factor" against any errors in approximation, but since the actual goal is to pile up bodies, we'll just make one more rounding up and say your general can expect to sacrifice 700 men before he can make his push for the prize. Would it be worth it? I'll leave that for the philosophers to debate; I hear Hadrian's building a wall. I am amazed at the cavalier attitude of the current generation of engineers. No safety factors to speak of. And clearly Engineer Chewie has not consulted his Hollywood guide to How Men Die. Flailing, theatrical demises right and left, backward and forwards - a classical engineer of the old (read 'my') school would factor in at least a 20% contingency for the ingrates who refuse to fall forward to expire. Then there are those who, not dead yet, refuse to stay in place. Granted that a percentage of these will be suffocated by successive sedimentary layers of death, a fair, statistically significant percentage will crawl from the slowly-forming bridge before its completion. Another 15% must be added here, as well. Consulting Means Guide to Medieval Labor Rates & Productivity,looking under 'Saxon Fodder,' one finds that a 25% deduction must be made due to the tendency of Saxons - not as stupid as history has accredited them to be - to run away in the face of lost causes. In order to avoid this deduction in productivity, the besieging general is advised in a Means footnote to utilize Irish soldiers in the front line, and only after priming them with copious amounts of ale. And, my dear Jenny, I am glad you were able to redeem the day. Don't forget to take into account those bodies that fall off the wall into the ditch too. We're assuming that these bodies will be Saxon, since the walls are Roman (the old British earthworks lie a little farther afield), so a six-foot estimation is probably accurate; and a stray Roman wouldn't mess up the math. Vegetius has the ideal soldiers down as "sturdy, unsophisticated country boys, just coming to manhood, about five feet ten to six feet tall." Thanks for the math! This will inevitably wind up in a story someday, you know; and when you read it, you can feel very proud of yourselves for having brought it about. I'm more inclined to philosophizing than engineering and war, and Marcus Aurelius I am not. I really appreciate the help and quips. 1,600 men is quite a slaughter. I would definitely have run away by then. This was entertaining; though I confess the thought of so many bodies dying just for the construction of a bridge makes me a little squimish, but then I'm inclined to squimishness from less severe occurrences. So is this seriously intended for a story was it more for the sake of curiosity? This is wonderful :) I wish I could take you to England, Jenny. A little while ago, my Dad took me on a walk into a field where a Roman Villa had once stood, and I thought of you when I was walking about it, trying to imagine the ancient feet that walked the land, or even just driving along the crazily straight Roman roads that are still used for that purpose, today. I research with pictures- if I'm writing a poem, or a riddle, I try to attain lots of images of the subject, and have them in mind when I write. "Give five engineers a problem, and you'll get back six solutions." Clearly some field testing is required before we can conclusively settle the matter. Get Tim started digging the ditch, and I'll put it a call to Ireland. Is it possible to throw a dwarf across an 80 ft. ditch, or is some means of mechanical propulsion necessary?